Merging tradition with highly edible innovation, now anyone can enjoy the timeless Salish journey as it continues with these recreations of classic Coast Salish spindle whorl art. Originally carved from wood, the spindle whorl was used by Coast Salish women to spin their wool into yarn. Using a spindle fitted with a large wooden whorl, Salish women spun the wool of mountain goats as well as specially bred dogs. 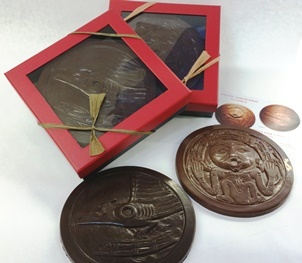 Inspired by 19th century Coast Salish Spindle Whorl Art, Seattle native Joseph Illg Crabcat allows us to experience the true Salish spirit while savoring Boehm’s elegantly handcrafted chocolate. 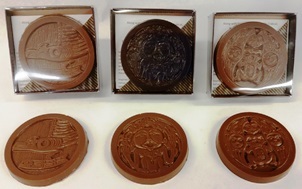 Boehm’s introduces three single small whorls in either our creamy milk or decadent dark chocolate. Each 3.2” in diameter whorl comes packaged with the back story and artwork description. 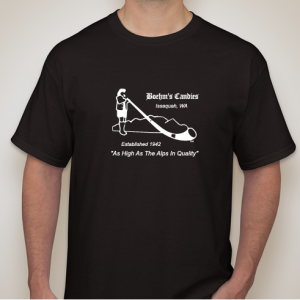 These can be purchased for $5.50 each, or come in a 3 pack with all designs for $16.95. 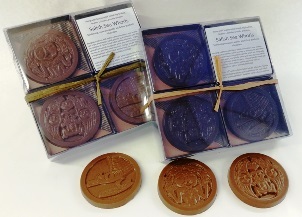 Two of the three designs (the Otter and Thunderbird and Whale) are also available in a larger 7” in diameter beautifully packaged presentation for $18.95. In ancient Pacific Northwest tradition, the Salmon Eater clan formed an alliance with earlier arriving inhabitants whose main totemic association was Bear and Wolf. They were truly inseparable as a mythological pair. 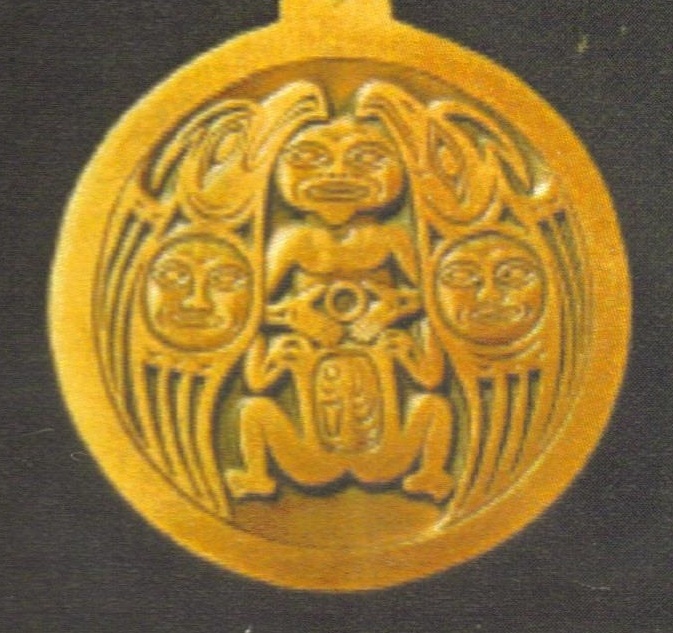 The Otter whorl art shows a coupling of transforming figures who embrace a squatting human/otter figure. Near the creature’s feet are three descending, feather-like spikes thought to recall the spiritual power of Thunderbird’s symbolism: past, present and future. Moving upwards, one finds the pair acquiring muscular forearms and shoulders with well-defined Wolf, Bear, and Otter like heads merging together. This merging is thought to represent an historical union of the new arrivals with the older occupants of the Pacific Northwest Coast in this symbolically rich Salish spindle whorl. 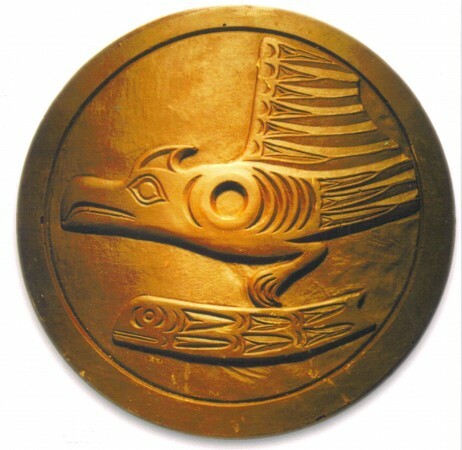 The Thunderbird is a mythical creature and a high risk ranking prestige crest. Only the most powerful and prestigious Chiefs have the Thunderbird as a crest. It possesses supernatural power and is credited with creating the storms. 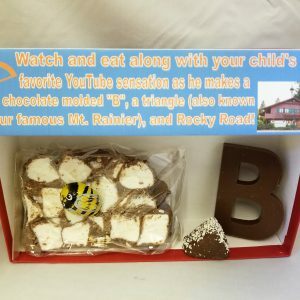 When he blinked, lightning came out of his eyes and when he flapped his wings, thunder roared. 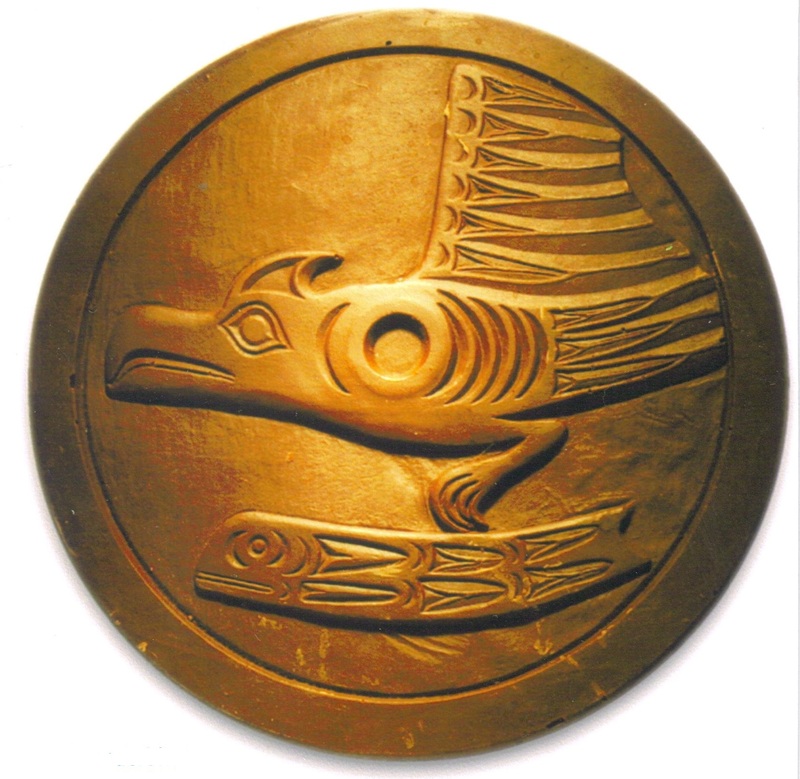 Frequently depicted in Native art, the Thunderbird is often shown clutching the Killer Whale in its talons, wings outspread. 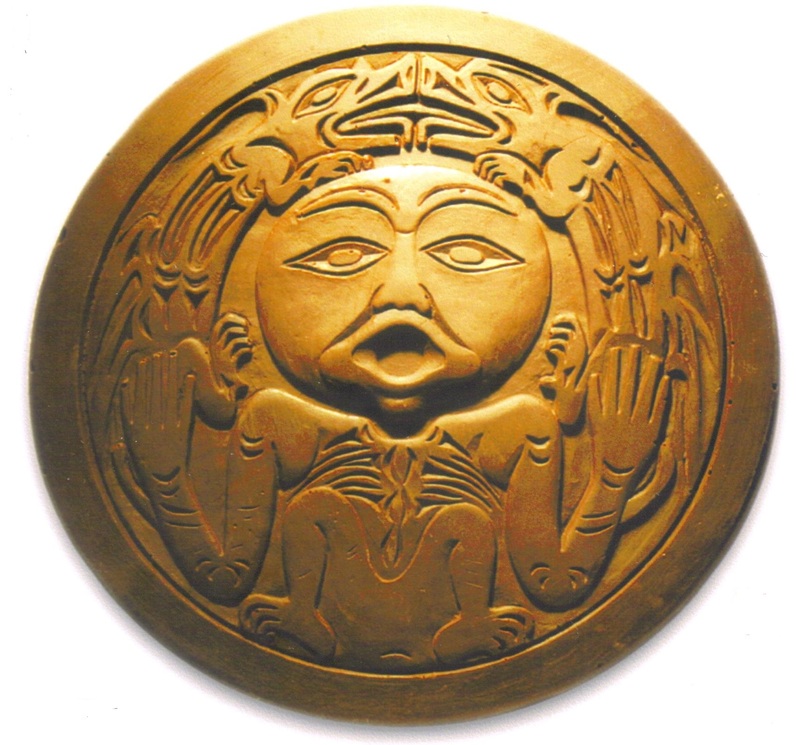 The representation of Thunderbird bears a striking resemblance to the eagle except that it has curly horns on top of its head. Many legends are associated with the Thunderbird. One prominent Coast Salish legend tells of the Salish people’s great dependence on the Salmon. One day, the Killer Whale swam into the bay and the Salmon were frightened away. Soon the people began to starve and called out to the Thunderbird for help. The Thunderbird swooped down, grabbed the Killer Whale, and carried him out to the sea. The Salmon returned and the people were no longer hungry. 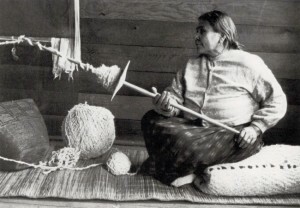 Weaving Woman is a classic example of Pacific Northwest spindle whorl art. This sculpture exhibits wonderful visual organization and planning. A pair of very stately birds is seen embracing the mysterious human figure. They are thought to depict mythological beings, the protective leadership of the Eagle, spiritual power of the Thunderbird or the supernatural power of the Raven. Two mask like figures are seen born upon the bird wing joints – they may be dream inspired spirit helpers. An embryonic froglike creature is featured, recalling lunar cycles, healing and continuity. The human figure’s hands converge at the center hole where the spindle shaft would meet the whorl. It’s here that Salish shamans believe that spirit powers enter and leave the body as wool is spun into yarn.